Hello friends. I’m Guy Kelly, and this is a place where I store my stuff. 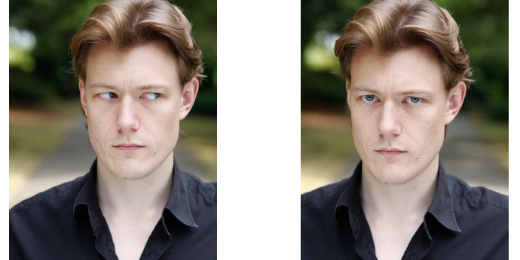 I’m an actor, comedian, writer and voice over artist. 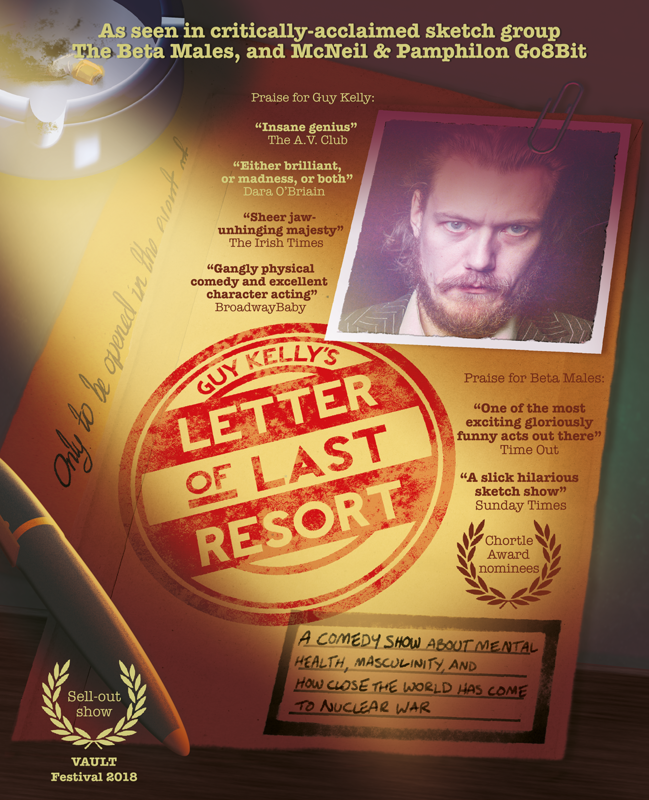 My solo show – Guy Kelly’s Letter of Last Resort – is a narrative stand-up show about mental health, toxic masculinity, and how close the world has come to nuclear war. It sold out its run at VAULT Festival 2018, and is coming to the Kings Place theatre in September. What about when I’m not making audiences cry/have panic attacks? Well. I’ve worked as a Maze Master at The Crystal Maze, which is, I’ll be honest, possibly the strangest way to make a living, as well as writing and performing critically-acclaimed, 5* sketch comedy with The Beta Males, selling out at the Edinburgh Fringe year after year. We may have put the live stuff in a little box for now, but rest assured that things are a-rumblin’ behind the scenes. Previously, I’ve written for the BBC, GinxTV, Future Publishing and TimeOut, and I’ve made immersive murder mystery games with A Door In A Wall. I also run the satirical @FoodPit Twitter account, where I review imaginary restaurants. It says a lot about the state of London’s pop-up culture that I continue to get invited to actual restaurant openings. Here’s a menu I prepared at the request of an American high-fashion magazine, as an example of what FoodPit can be when not constrained by 14o characters. When I’m not sweating into a waistcoat or blagging free meals, I’m a big old gamer. I’ve a few episodes of a podcast here, have written for Vice Gaming, and was part of the live comedy gaming show McNeil & Pamphilon Go8Bit (which has since become a series on UKTV). I can also complete the first level of Sonic 2 blindfolded, with my feet, and in under a minute. That’s all for now! This page will be updated on a regular basis. Meanwhile, why not follow me on Twitter (@Brainmage), and have a poke around the site? There are some blogs and bits of non-fiction, as well as some lighter comic pieces. You can also find my Existentialist children’s story “Why is Mummy So Sad?” by clicking here. The Sorcerer is an evil wizard and in this case the evil wizard is fate. The fact that somebody can walk out of their front door and a hurricane can take them away, an earthquake or something falling through the roof. And the idea that we don’t really have control over our own fates, neither our births nor our deaths, it’s something that has haunted me since I was intelligent enough to contemplate something like it.